On the 8th (Thu), stroll through Pedra do Arpoador, then enjoy the sand and surf at Praia de Ipanema, then enjoy the sand and surf at Copacabana Beach, and finally view the masterpieces at Centro Cultural Municipal Parque das Ruinas. To find ratings, other places to visit, reviews, and tourist information, you can read our Rio de Janeiro day trip planning website . Belo Horizonte to Rio de Janeiro is an approximately 2-hour combination of bus and flight. You can also fly; or drive. In August in Rio de Janeiro, expect temperatures between 30°C during the day and 22°C at night. Finish up your sightseeing early on the 8th (Thu) so you can travel to Sao Paulo. On the 9th (Fri), browse the fresh offerings at Mercadao - Sao Paulo Municipal Market, then don't miss a visit to Paulista Avenue, then look for gifts at Livraria Cultura, and finally get into the urban bustle at The Julio Prestes Cultural Center - Sala Sao Paulo. For other places to visit, ratings, more things to do, and more tourist information, read Sao Paulo trip planner. Getting from Rio de Janeiro to Sao Paulo by flight takes about 1.5 hours. Other options: do a combination of flight and bus; or drive. Traveling from Rio de Janeiro in August, Sao Paulo is slightly colder at night with lows of 15°C. 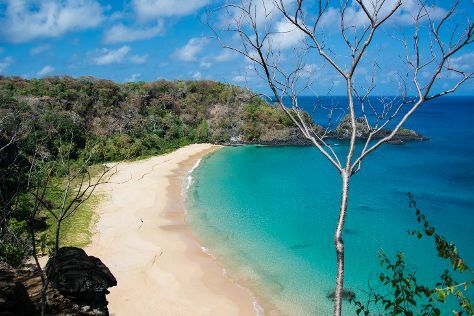 Cap off your sightseeing on the 9th (Fri) early enough to travel to Fernando de Noronha. Relax by the water at Fernando de Noronha and Praia do Sueste. Projeto TAMAR Fernando de Noronha - Patrocínio PETROBRAS and Capela de Sao Pedro are good opportunities to explore the local culture. And it doesn't end there: enjoy the sand and surf at Conceicao Beach, contemplate the waterfront views at Buraco do Galego, and stroll through Praia do Cachorro. For maps, traveler tips, photos, and more tourist information, refer to the Fernando de Noronha online trip builder . Traveling by flight from Sao Paulo to Fernando de Noronha takes 6.5 hours. You'll lose 1 hour traveling from Sao Paulo to Fernando de Noronha due to the time zone difference. Prepare for a bit warmer weather when traveling from Sao Paulo in August: high temperatures in Fernando de Noronha hover around 33°C and lows are around 28°C. Finish your sightseeing early on the 12th (Mon) to allow enough time to travel back home.